After the sun the rain. After the mini-skirt came the midi-skirt. You might wonder how the pattern companies made their money. Selling a simple A-line skirt with four black cutting lines printed across it for five shillings and five pence. View 2 – pink with spotty tights – was a novelty in the early 1970s when the world had got sick of the mini. 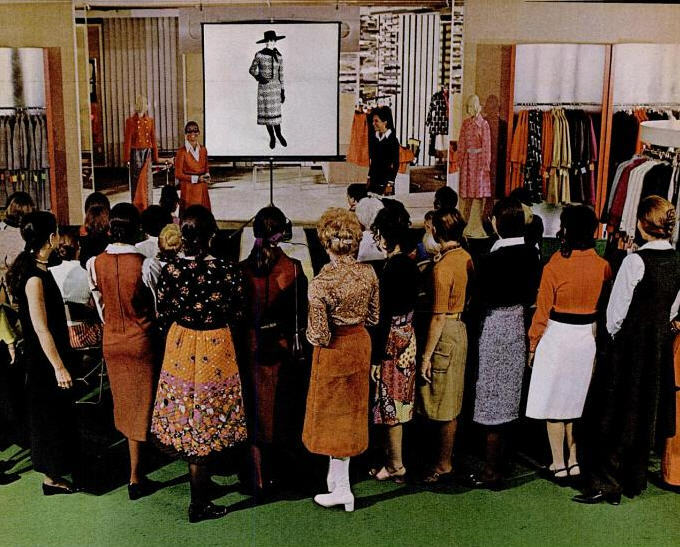 A more luxurious skirt, long and elegant with elegant fitted jackets or floaty blouses was what we craved. I remember as a teenager getting a lined, black wool, A line, fitted midi skirt and feeling very grown up. The skirt was introduced by the design houses, who had to keep reinventing fashions to keep the public buying continually changing fashion. Fashion is essentially about making what we own seem dated and dowdy and what is available desirable and new. Here it appears the midi-dressed staff (or customers?) are getting a lecture on the new length. And apparently there were riots in the streets! Young women did not want to conform to the new trend. They loved their teeny-tiny skirts! They wanted their knees on show and the opportunity to run about without constriction. So they organised protests. The Mirror ran the “campaign”, to the evident delight of men everywhere. 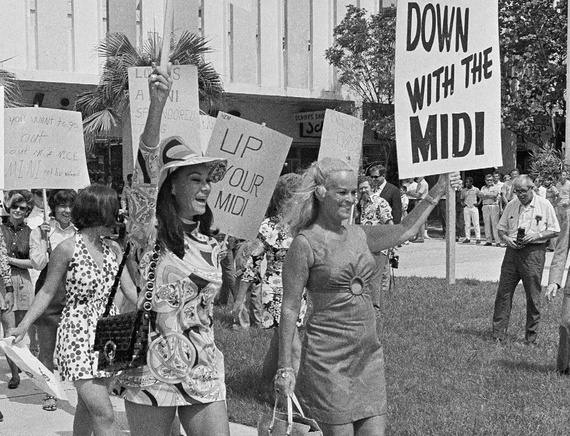 The Americans did it too – here in Florida where it is surely too hot for the Midi. Look at the men, standing on the sidewalk, enjoying the show. Unfortunately the Midi-length – the below the knee skirt – still has an unfortunate reputation as old maid’s wear. A saggy midi skirt in brown polyester is probably as bad as it gets in terms of women’s wear. 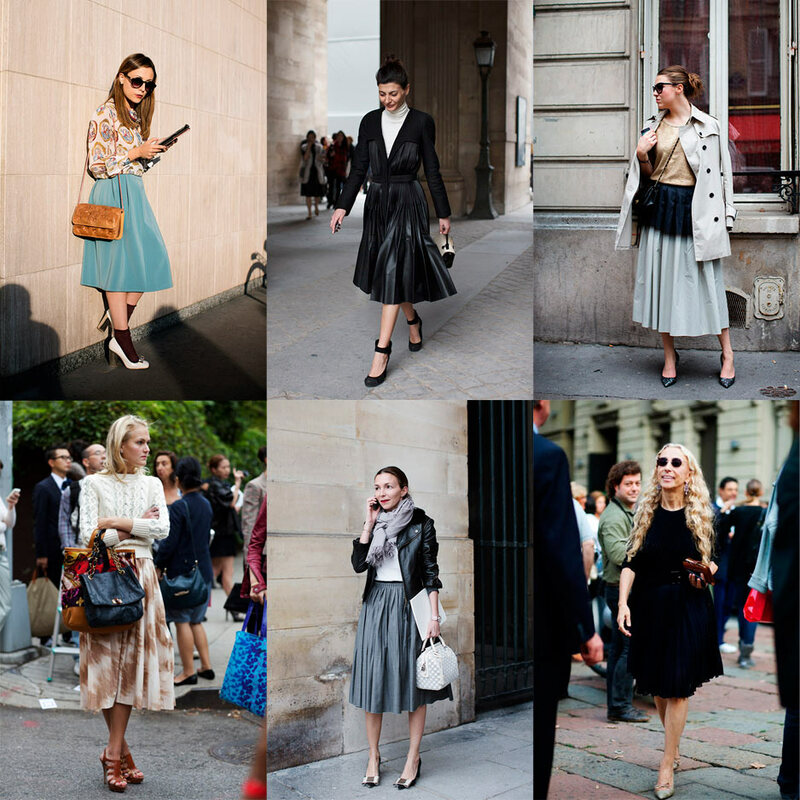 But as fashion loves change we will see longer skirts appearing again and again. Not long ago the Victoria Beckham pencil skirt was long, clingy and hard to wear (even by Victoria). Current trends for below the knee are fuller skirts which work successfully on more moderate body shapes. 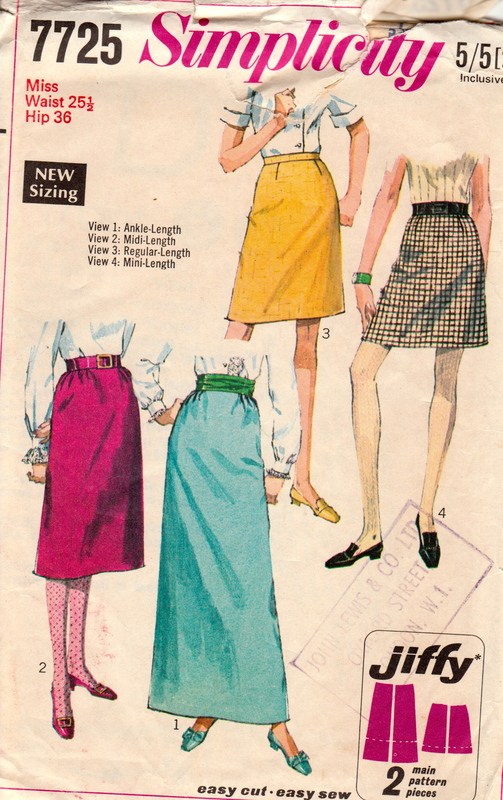 These skirts usually fit on the waist, and are gathered or pleated to give a wide line at the hem. I have been thinking of using my knife printed fabric for a skirt of this type. The effect here is to make the calf look slimmer. This montage from The Sartorialist. So who suits a midi skirt – one that ends mid calf? I really like this style of skirt but with only being 5’3″ I have to watch the length. I tend to keep my hems just under the knee and definitely a slim fitting top half to the outfit. I have a great dress that is mid calf length but it needs heels.